Don’t have a PayPal Business account? Small business funding from $5,000 to $500,000. See how the PayPal Business Loan makes financing straightforward and simple. Choose the loan amount and term (13 to 52 weeks based on loan amount) that fit your business needs. Predictable weekly payments will be made automatically from your bank account so there are no monthly bills to remember. the lender asked for and approved the loan by 5:00 p.m. Eastern Time, Monday through Friday (excluding bank holidays). **In addition to the fixed fee (Total Interest Charge) for the loan, the only other cost is a $20 Returned Item Fee that is only assessed if a payment is returned. Is my business eligible for the PayPal Business Loan? 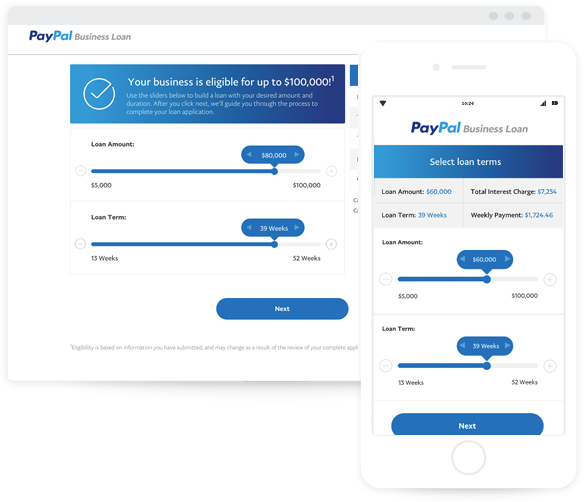 Here are some of the minimum criteria for the PayPal Business Loan. 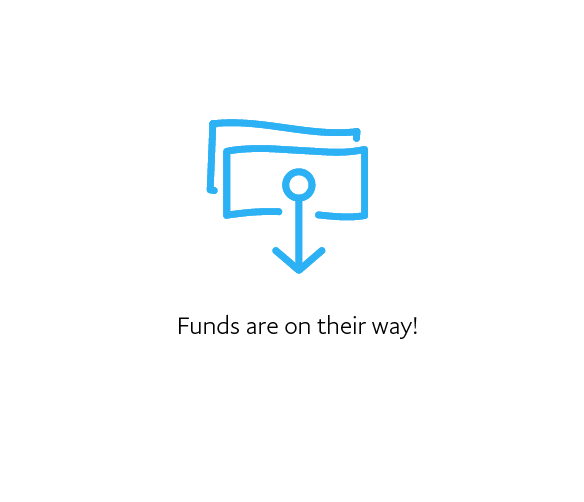 A PayPal Business account is required to fund your loan (processing payments with PayPal is optional). Don't have one? Sign up for free. Your business must have at least 9 months in business. $42,000 or more in annual total revenue. Over 550 different industries served. See FAQ. Applying is simple and easy. Check your business's eligibility in minutes. Fill out the short and sweet online questionnaire. Customize your loan. Choose your loan amount and term within your business's estimated eligibility range. Underwriting review. If any other documents are needed, we'll reach out to you. You can monitor your progress in our portal. Get your funds. 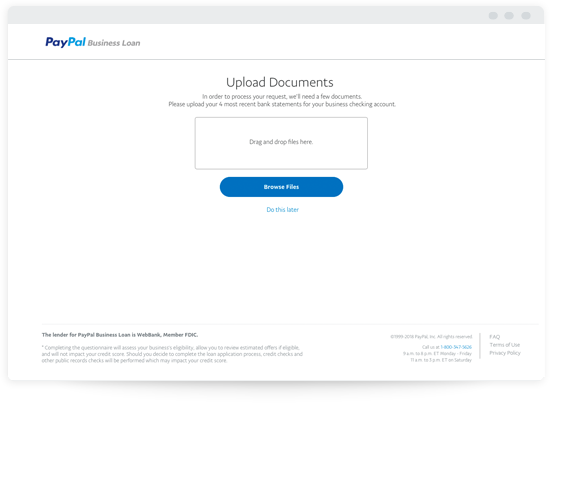 If approved, sign your loan agreement and your loan will be securely transferred from the lender into your PayPal Business account. “The PayPal Business Loan offered very competitive pricing, and it was a fast and easy process. It was actually terrific because the credit evaluation is so much more effective than traditional banks." 1. How does a PayPal Business Loan work? You must complete a 5-10 minute online questionnaire to determine your business’s eligibility or by calling a Business Funding Expert at 1-800-941-5614. Once the questionnaire is complete, estimated loan terms can be customized by adjusting the loan amount and duration to compare the costs of financing. Once you select your desired terms and completed the application, if approved, you will be prompted to electronically sign a contract that will be emailed to you and includes bank instructions so that payments can be debited weekly from your business checking account. 2. If approved, how can I get the funds? 3. Is my business eligible for the PayPal Business Loan? 4. Will exploring a PayPal Business Loan impact my credit score? 5. How much can I apply for? Speak with our Business Funding Experts. Our U.S.-based team is available between 9 a.m. and 8 p.m. ET Monday - Friday and between 11 a.m. to 3 p.m. on Saturday. It takes just minutes to check eligibility for the PayPal Business Loan. *Completing the questionnaire will assess your business's eligibility, allow you to review estimated offers if eligible, and will not impact your credit score. Should you decide to complete the loan application process, credit checks and other public records checks will be performed which may impact your credit score. Fast funding for your business is just the beginning. Open a PayPal Business account and join over 18 million businesses that fuel their business with PayPal. Accept payments online, in store, or on the go. Plus, you can connect your business to over 200 million account holders who trust the PayPal way to pay. Send customized invoices that your customers can pay quickly online with a credit or debit card, PayPal, or PayPal Credit*. Whichever payment method they choose, you receive your money usually in minutes. Offer PayPal Credit* with no risk or cost to you. Your customers can use this revolving credit line to get No Interest if paid in full in 6 months on purchases of $99 or more. With the PayPal Here app and your choice of card readers, you can accept chip cards, magstripe cards, and contactless payments like Apple Pay - on the go or in your store. Don't have a PayPal Business account? The lender for PayPal Business Loan is WebBank, Member FDIC.